Home / Mixed Bag / My Most Memorable Memento ! My Most Memorable Memento ! I opened my cupboard, it was so messed up. I always did organize it but it stayed neat only for couple of days. However, one compartment was always carefully maintained, the place where I kept my 'Precious Memento's'. Well, I love receiving mementos, keepsakes, souvenirs in general any kind of gifts (we all do right?). Fortunately I have many memento's here which remind me of different stages of my life. I look at my BIRTHDAY CARD's collection, I am biased towards the handmade one's by my lazy friends who never painted or sketched anything in life before. I also have a book, which I never read and in between its pages you will find few old dried roses(NO details given). 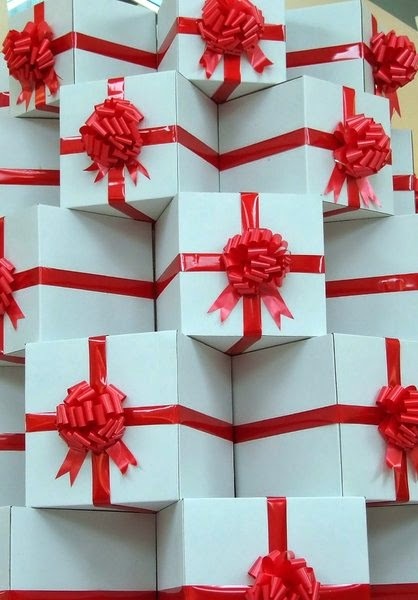 Then there is a big red envelope, in which I keep my Love letters ( from whom?? obviously from my Lover?). I Am a romantic, call me old fashioned but I still prefer handwritten letters over emails. I keep these very carefully because three of them have been written on big tissue papers. I suddenly realize my favorite memento is not here, I get up and walk towards my purse. I open my purse, he is sitting there in a small box, silently watching me the whole time, I smiled and picked him up. 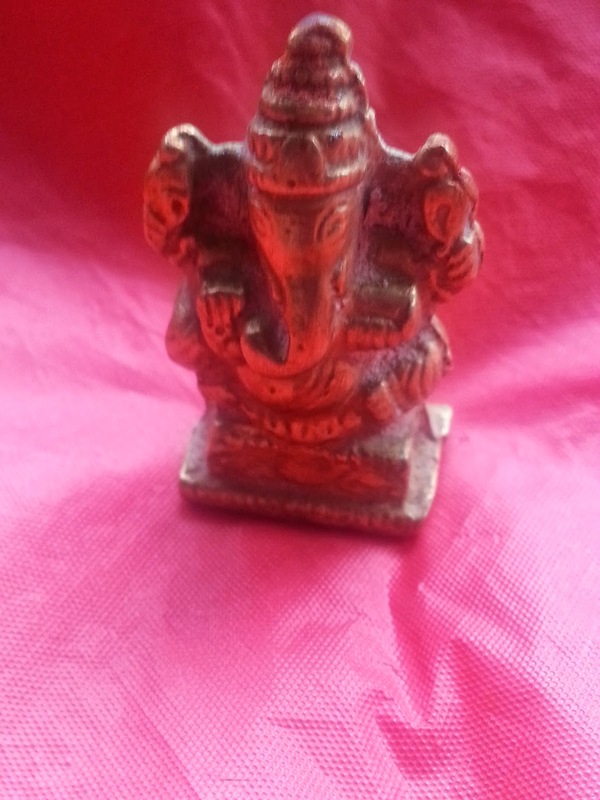 Yes he is my Ganapathi. I have never been a religious person, nor am I now. I have never been told that I have to perform certain rituals. In short, I was never bounded by traditions and obligations to do something like praying everyday, performing puja's, fasting on particular days etc. I was not an Atheist, but then I had developed a sense of resentment towards God. I visited temples and joined hands, with a blank mind. Strangely I respected people who were religious. Contradicting to my feelings, I admired them for following certain daily rituals. This was one of the quality Mr.K had. 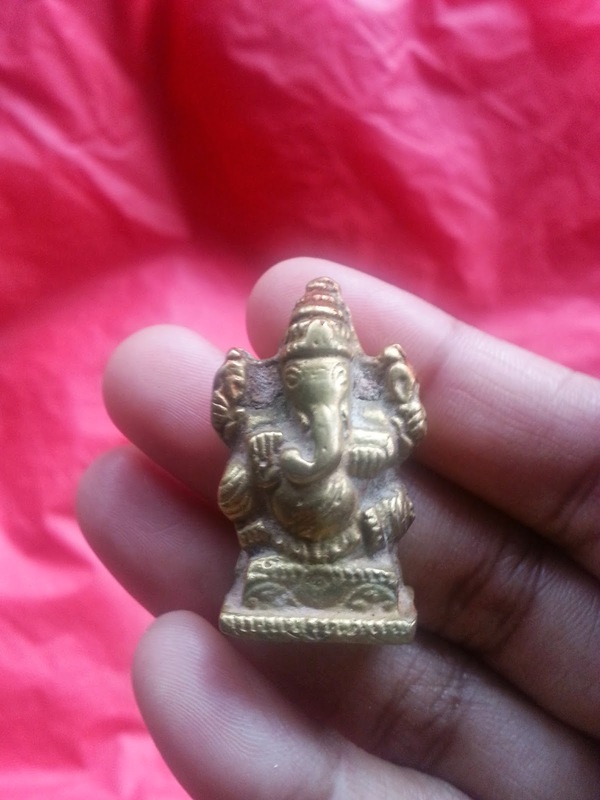 The day Mr. K understood my bitter feelings towards God, he gave me this Ganapathi. He said " Its a old idol, don't remember who gave it to me but its always been there in my room for as far as I can remember. From today it's yours! 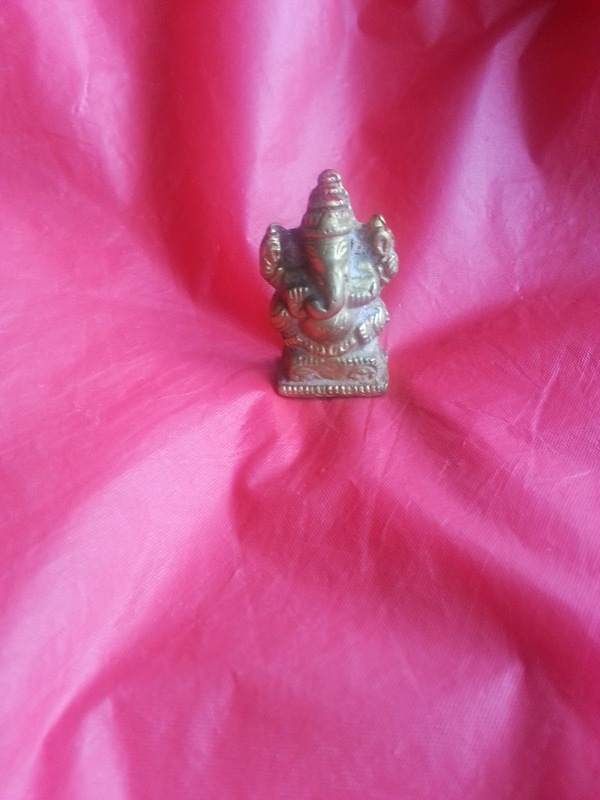 Treat Ganapathi like a friend, talk to him, tell him what bothers you. Share your joys, even more important share your fears. Tell him your dreams, tell him your plans for future. Respect him and Believe in him". I had my own doubts of doing what Mr. K asked me to, but I decided to follow his instructions. In the beginning it was difficult, I couldn't really share my fears but as days passed by my communication with Ganapathi grew stronger. I could feel there was some sort of a connection. I started praying daily and chanting a slokha (a verse), which filled me with positive thoughts, there were problems but I felt strong inside. I started visiting temples and reading mythology, first being Ganapathi's story. I felt grounded, found peace within. Ganapathi taught me the serenity to accept the things I cannot change, the courage to change the things I can, and the wisdom to know the difference. This is my best Memento, the one which can never be replaced. It not only changed my perception towards God, but renovated my belief system. I owe this to Mr. K and cannot THANK him enough. Lovely Ananya. It is true that faith is the elixir of life .. much more than hope, which is also regarded much the same. It was wonderful reading through your post. Wishing you all the very best for the contest. Thanks for your wishes, I hope they consider my entry. The change from being an agnostic to one who believes in the existence of God comes about abruptly.Thanks to K you have become a believer and spiritual. My best wishes to you in the contest. that was indeed a precious in every aspect :) .. i too love hand written things so much that i still write my poems and every thing on paper before typing them .. ! That was a sweet thing to share...loved it!